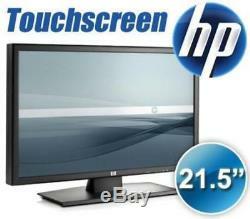 HP L2105tm 21.5 Full HD TOUCHSCREEN LCD DVI VGA Monitor touch screen. This sale is for a HP L2105tm 21.5 Full HD TOUCHSCREEN LCD DVI VGA Monitor touch screen. Great shape - Excellent working condition. Includes power and standard VGA video cable! This is our way of saying thank you for allowing us to serve you. Dimensions (H x W x D). 41.86 x 51.3 x 23.05 cm (16.5 x 20.2 x 9.1 in). 33.52 x 51.30 x 7.505 cm (13.1 x 20.2 x 3.0 in). 50.0 x 57.55 x 22.4 cm (19.7 x 22.6 x 8.8 in). 4.8 kg (10.6 lb). 6.4 kg (14.1 lb). 8.2 kg (18.1 lb). 5° to + 20° vertical. 21.5-inch Wide-Aspect Active Matrix TFT (thin film transistor). 21.5 in (54.9 cm) widescreen; diagonally measured. Screen Opening (W x H). 18.8 x 10.6 in (47.6 x 26.8 cm). Up to 170° horizontal/160° vertical (10:1 minimum contrast ratio). Backlight Lamp Life (to half brightness). 72% color gamut (NTSC, TYP). On Screen Display (OSD) controls specifications. Buttons or Switches (OSD closed/OSD open). OSD menu/Select, Volume/OSD left, brightness/OSD right, Auto Adjust/ Exit, Power. English, French, German,ish, Italian, Polish, Dutch, and Russian. Brightness, contrast, positioning, color temperature (6500k, 9300k, custom), individual color control, serial number, clock, clock phase, input, volume, factory reset. Preset VESA Graphic Modes (non-interlaced). 180 MHz (analog input); 180- MHz (DVI input). 120 point/ sec (single-and multi-touch). 640 x 640 (Real Pixel). Finger and stylus > 3mm (diameter). < 3 watts, including LED. One DVI-D to DVI-D and one 15-pin D-sub (VGA). 1.8 m (5.9 ft), DVI-D 21.8 m (5.9 ft). Included, length: 1.8 m (5.9 ft). Auto-Sensing, (100 to 240 VAC)+/-10%, 50 +/-3 Hz to 60 +/-3 Hz. < 2 watts standby; < 1 watt off. 1.9 m (6.2 ft). 5° to 35° C (41° to 95° F). 20° to 60° C (-29° to 140° F). 5% to 95%, 38.7° C max wet-bulb. 0 to 10,000 ft (0 to 3,048 m). 0 to 9,144 m (0 to 30,000 ft).